Patterns lets you quickly define regular patterns for multiple purposes. 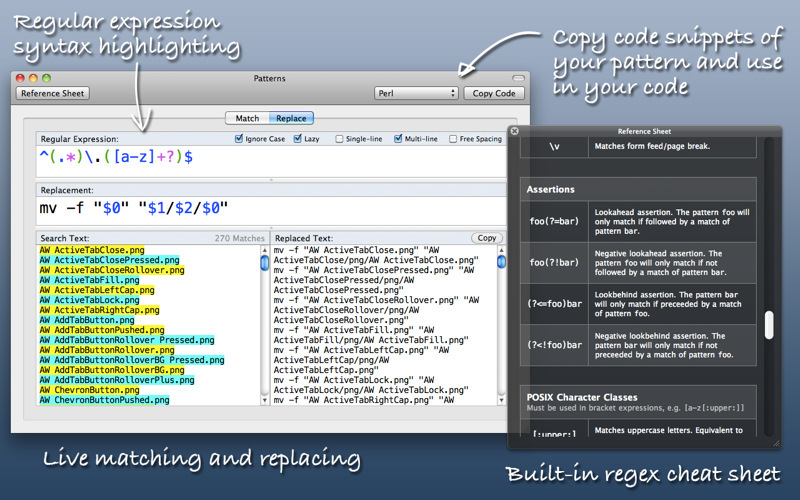 Moreover, the Patterns app provides you syntax coloring features and matching specific features. All the changes and occur in real time. NOTE: Patterns can only be purchased via the Mac App Store (the buy link redirects you to its App Store page). To purchase/download applications via the App Store an Apple account is required. · Regular expression syntax coloring makes it easy to see how your pattern is interpreted by the regex engine. No more confusion about what needs to be escaped. · See matches and replacements in real time while you edit your pattern. · Copy match and replacement code snippets of your pattern for quick use in a number of different programming languages. · The built-in regular expression reference sheet helps you find the piece of regex syntax you need.